Aleksota is the mother of several broodmares and breeding stallions, including Algorytm by *Algomej. Algorytm's full brother *Algonkian was a breeding stallion in the US. The dam line that Aleksota belongs to is the family of Mlecha OA, from a Kuhailan strain, who was imported to Jarczowce in 1845. This family has produced a number of great stallions as well as good mares. The family has two major branches, through Lysa 1915 and Fanfara 1914. Aleksota was imported along with her mother Alfa to Blommeröd. These two mares have been very valuble to Blommeröd, producing the stallions Algorytm, Alrex, Alfar, Spartacus and *Algonkian. This family is also noted for it's athletic ability, Aleksota produced Solid, a champion western horse and Algorytm raced at the Warsaw racetrack. Alfa produced the successful endurance horse Alfar. Aleksota belongs to the Fanfara branch. Fanfara produced Pomponia II 1924 who was the granddam of Alhambra 1943, dam of Alfa. Alfa was full sister to *Ambara, dam of *Amfibia. Pomponia II's first daughter, Zorza Pelkinska, is well known in Sweden. She was the granddam of *Wielka Kometa and of the wonderful Wielka Este. 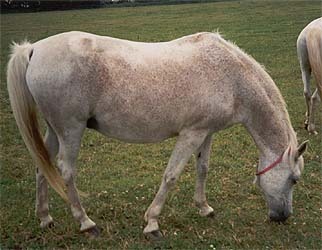 Wielka Este was one of the oldest mares in Sweden and was exhibited during a break at the World Cup Show in Stockholm 1990. She was then 28 years old! I've had the honour to meet this mare and she was a great personality with a great presence. Another Pomponia II daughter is Cemira 1933 who was the granddam of Bint Munira 1942 imp Sweden.